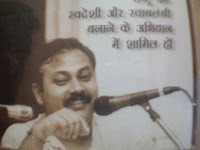 " I pray to God for long life of brave and great India patriot Shri Rajiv Dixit . He never fear from any political pressure and MNC pressure . We need such great person these days who can fight and can provide real freedom where Indian can do every work without slavery of language or culture of Western. I also thanks to you for making this blog " Protect your freedom " . Please tell us new movements of Bharat Swabhiman . " Bharat Mata ki Jay.. I adore and respect Rajivji.. god will give him more power and courage for our battle.